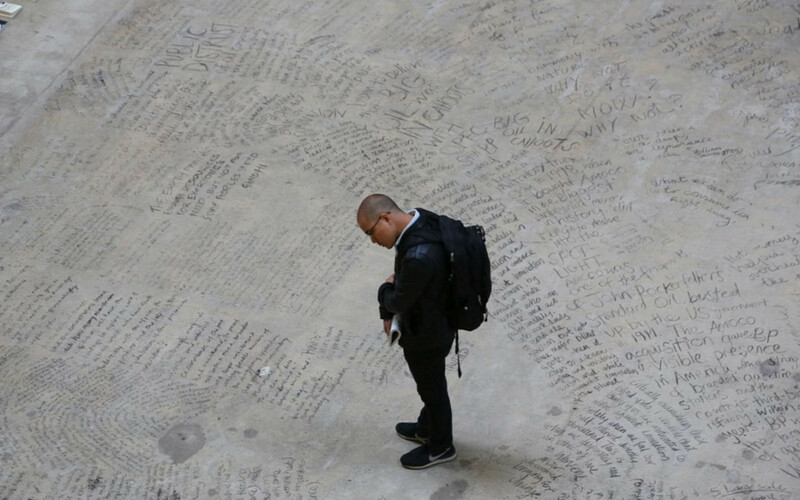 In June 2015, Liberate Tate protesters occupied the Tate Modern museum in London for 25 hours, covering the floor with words of warning about climate change. As part of the broader call for organizations to divest from fossil fuel interests, Liberate Tate has been protesting the £224,000 the Tate Modern museum receives from BP each year. Words charcoaled on the floor included passages from the IPCC climate science report, and the books This Changes Everything by Naomi Klein and Oryx and Crake, by Margaret Atwood. The Tate Modern allowed the protest to unfold, even (after some grumbling) allowing the protesters to stay the full 25 hours. For more on the occupation, see the coverage by The Guardian.